For all of Italian heartbreak at the World Cup (1970, 1994), and outright humiliation (1966, 2002), it is the European Championship that remains Italy's ultimate bête noire. Four World Cup triumphs are an antidote to the four agonizing years previously mentioned, but Italy have won the European Championship only once: in 1968, and even that victory came after a huge dose of luck. Italy were hosts that year, a year that marked the first time the tournament was called the European Championship instead of the European Nations Cup. 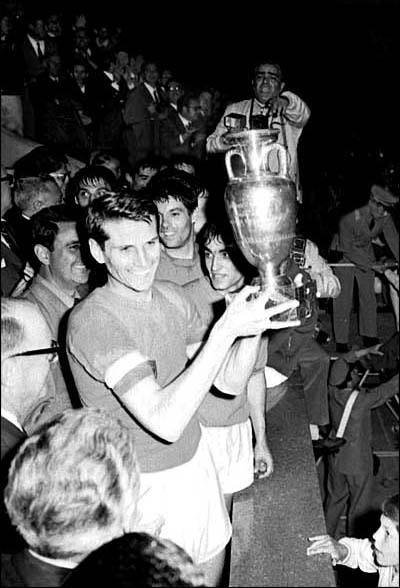 The format of the tournament also slightly varied from the 1960 and 1964 editions: a group phase replaced the two-legged home and away knock-out round. In the quarter-finals, Italy overcame Bulgaria, setting up a semi-final match against the then USSR. After they battled to a 0-0 scoreline, and after extra-time couldn't separate the two sides, a coin toss resulted in Italy as the winner. Incredibly, Italy were through to the Final through a method that made penalty shoot-outs look compassionately fair. The Final needed a replay to decide the winner. Italy and Yugoslavia battled to a 1-1 draw in the first game after Angelo Domenghini responded to Dzajic's opening goal for Yugoslavia. Two days later, the replay saw Italy run out winners as Gigi Riva's and Pietro Anastasi's goals floored Yugoslavia. It was a European triumph, but it came via a tortuous path, whose turns and twists prevented Italy from getting full credit. That team had Dino Zoff, Giacinto Facchetti, and Riva, but it was the coin-toss semi-final win that pushed Italy to glory. Since then Italy have had virtually no luck in the European Championships. In 1980, for example, Belgium denied Italy a place in the Final by frustrating them to a 0-0 draw in the last game of the Group Stage. Both countries finished on the same number of points in the group, but Belgium went on to play West Germany in the Final not on goal difference, but on goals scored--three to Italy's one. In later years, Italy were eliminated at the Group Stage due to a combination of ineptitude and misfortune. In 1996, Italy defeated Russia in their opening game, and looked to be on course for the quarter-finals. However, a 2-1 defeat to the Czech Republic in the next game meant that Italy had to beat Germany to ensure qualification. A draw would only suffice if Russia beat the Czech Republic in their final game. In the 85th minute, Italy seemed to be inching towards the quarter-finals, as Russia were leading the Czech Republic 3-2 while Italy were deadlocked against the Germans 0-0. However, Vladimir Smicer scored a late goal for the Czechs to eliminate Italy. 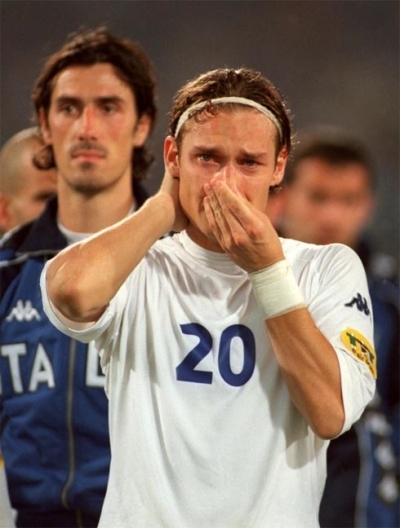 During Euro2004 in Portugal, Italy were left to rely on other results once again--and once again it was all in vain. Italy had drawn 0-0 with Denmark in their opening game, and could only collect another point against Sweden in their second. The results meant that Italy needed to beat Bulgaria in their final group game, and hope that the game between Denmark and Sweden not end in a 2-2 (or higher) draw. Italy beat Bulgaria with Antonio Cassano scoring in injury-time, only to learn that Denmark and Sweden had indeed played to a 2-2 draw. As news filtered through, Cassano sunk in despair in the Guimares rain. However, as painful as those two European Championships were, the most excruciating fate awaited Italy in Euro2000. Not many expected Italy to do well at the tournament being held in Holland and Belgium as coach Dino Zoff was without striker Christian Vieri and first-choice goalkeeper Gianluigi Buffon (both out injured) going into the tournament. However, players like Stefano Fiore, a young Francesco Totti, and the peerless defensive trio of Paolo Maldini, Alessandro Nesta and Fabio Cannavaro inspired Italy to the Final where they took on France. In the Final, Zoff opted to start with Marco Delvecchio and Totti up front with Udinese's Fiore playing right behind them. Ten minutes into the second half, Delvecchio struck. Totti laid a brilliant backheel pass on for Gianluca Pessotto, who crossed in low for Delvecchio to volley home past Barthez. Italy had played superbly up until that point and were deservedly in front. Even after Del Piero, who replaced Fiore early in the second half, missed two supremely simple chances, Italy looked well placed to go on and win their first European Championship in thirty-two years. However, a cruel--indeed tortuous--conclusion was yet to come. With less than two minutes to go, Barthez cleared long up the field, and Cannvaro mistimed his header straight into the path of Sylvain Wiltord, who guided the ball past a helpless Francesco Toldo in goal. Italian players looked totally deprived of strength and hope after that goal, and it was little surprise when David Trezeguet scored the golden goal winner in extra-time. That game remains my most painful memory of football--more painful than Baggio's miss in 1994, and more painful than even Milan's farcical capitulation to Liverpool in the Champions League Final of 2005. Italy came within seconds of winning that tournament, and the way they had played that Final in Rotterdam merited a win. Between 1972 and 2008, Italy has had little to celebrate in the European Championship. Here's hoping Cesare Prandelli and his side, against daunting odds, change that in Euro2012.